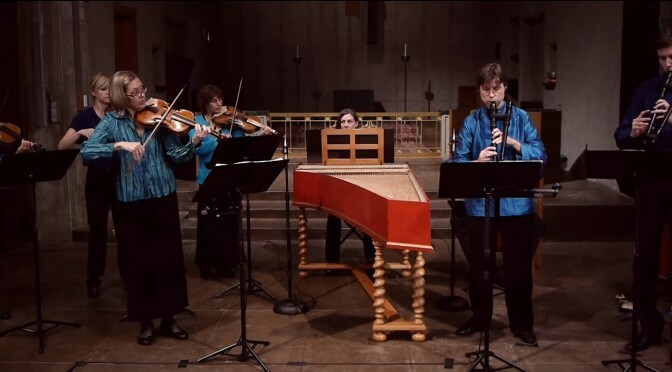 California based early music ensemble Voices of Music performs Johann Sebastian Bach’s Brandenburg Concerto No. 4 with original instruments. Recorded at St. Stephen’s Episcopal Church, Belvedere, California. Please consider a donation, and support this wonderful ensemble. Hanneke van Proosdij and Andrew Levy, recorders. Katherine Heater, double manual harpsichord by Johannes Klinkhamer, Amsterdam (1996), after Ruckers-Goujon, Neuchâtel, Switzerland, 18th c.
The six Brandenburg concertos represent the summa of chamber music in the high baroque period: for the fourth concerto (BWV 1049), Bach chose the unique and imaginative texture of baroque violin and “echo flutes” (a type of baroque recorder) for his soloists. “Concerto 4to à Violino Principale, due Fiauti d’Echo, due Violini, una Viola è Violone in Ripieno, Violoncello è Continuo.” For the video, the ensemble use the “echo flutes” for the slow movement, then break them apart for the first and third movements. The outside movements feature exceptionally virtuosic writing for the violin, with extended passagework spanning the entire range of the instrument. For his fourth concerto in the set of Brandenburgs, Bach is especially careful with the orchestration: this creates space for the recorder sound to breathe; in addition, his compositional style flows with sparkle and wit. The fourth Brandenburg concerto is unusual in that Bach specifically calls for “echo flutes”, or “fiauti d’echo”. For many years musicologists have debated what an “echo flute” exactly is, and have also uncovered a great deal of historical detail, but the work is usually performed with two alto recorders. Other historical accounts refer to a number of virtuoso players of the echo flute in different countries, and describe the instrument as two recorders or similar wind instruments, one of which is voiced softer than the other. Surviving echo flutes, consisting of a pair of recorders joined together, show that instrument makers of the time were keenly aware of how to voice the two instruments to create differences in sound. The baroque echo flute solves a fundamental problem with the recorder and other wind instruments which is that as the player blows softer, the pitch goes lower. Since both echo and dynamic effects were essential to baroque music, the echo flute is a recorder that can play dynamics—and play them well in tune. For our recording, we have chosen recorders that have a difference in color and articulation as well as in the volume of sound. We believe that Bach, who played the double-manual harpsichord as well the organ, would have been drawn to an instrument that could realize a rich palette of colors for the performance of his work, just as the harpsichord, which has two complete sets of strings, provides contrasts in color and articulation as well as in dynamics. This concerto is part of the Voices of Music Great Works project. A Creative Commons edition of the score, based on the composer’s manuscript, will be published to accompany the complete recording, and the recording will be available worldwide on Blu-Ray and CD, and for free on MP3 and highdefinition, 24 bit FLAC files. First published October 22, 2013.